An upward view of the beautiful Sacre Coeur Basilica in Montmarte in Paris, France. I visited Sacre Coeur Basilica on a warm August day. With many hundreds of visitors the line to get into the basilica was both long and slow moving. But it was worth it. Despite all the people, and the fact that photography is not permitted inside, it's an opportunity for folks visiting Paris that should not be missed. Architecturally the basilica is gorgeous and it’s hard not to be moved by the deep sense of devotion evident amongst many of those visiting Sacre Coeur. 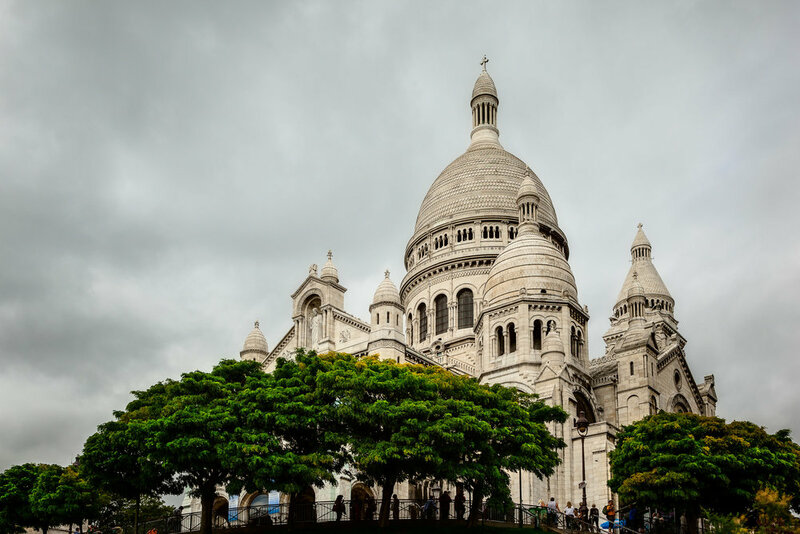 A view up towards the domes and stautes that feature so dominantly on the exterior of the Sacre Coeur Basilica in Paris, France. Cloud cover may not always produce compelling skies, but it does produce a larger, softer light source than would be the case with direct sunlight. Soft light is both beautiful and expressive, and it extends your ability to record details in highlights and shadows that would otherwise be lost under brighter and more direct lighting. Stained glass window in a small chapel next to the Sacre Coeur Basilica in Paris, France. It was disappointing not to be permitted to make photographs inside Sacre Coeur. As a travel photographer that was my intention for visiting the basilica and I needed to find a way, without breaking the rules, that would allow me to do so. I entered a small chapel to the side of the cathedral where I was able to photograph unhindered. However, I was careful not to move onto the altar area and to move well and truly out of the way when more devout pilgrims entered the space. I think it's important to be respectful of both the place and of the needs of others. I'm happy for my own experience to be somewhat compromised so as not to adversely affect the experience of other travelers. Finally I moved outside to try and make an image of the front of the basilica. The main steps leading up the hill to the front entrance were full of people, so I moved around to one side to avoid them and to find a vantage point that would allow me to explore the shapes of the domes and towers. This helped to provide a more three dimensional view of the cathedral, as illustrated at the top of this post. Light shines threw a stained glass window and adds streaks of color to the stone floor of a chapel in Paris, France. It was the very last day of a 6 week trip and, frankly, I was exhausted. I really had to push hard on that final day, but a tourist ride on an open-air, double decker bus and my trip to Sacre Coeur Basilica made for a fun day with numerous photo opportunities. I’ve been fortunate to have traveled to Europe on several occasions, and often think about my next trip. And its hard to do so without include Paris, once again, in my itinerary.